After Jim’s Washington show, Sam and Friends, ended in 1961, he started thinking about creating a longer form program. 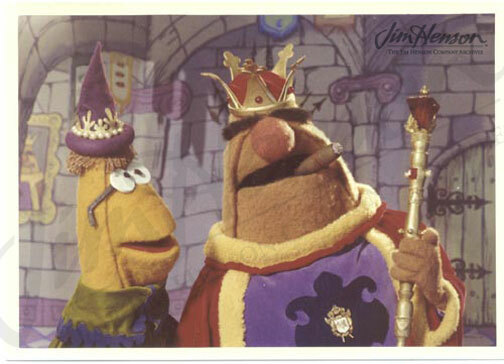 Fairytales provided rich inspiration for many types of entertainment, and Jim saw all sorts of comic possibilities in combining traditional characters, settings and stories with the Muppet sensibility. He began sketching witches, kings, princesses and noblemen and collaborated with Jerry Juhl on concepts for a show. The result was The Tales of The Tinkerdee, a pilot for a series chronicling the activities in the court of King Goshposh as narrated by a minstrel played by Kermit. Jim shot the pilot at The Protestant Radio and Television Center in Atlanta where he had produced some PSAs for the National Council of Churches. Despite Jim’s best efforts to sell the show, it never aired. In the summer of 1964, Jim tried again with Tinkerdee. With the success of Rowlf on The Jimmy Dean Show, Jim’s work had become nationally known. The Quaker Oats Company was interested in sponsoring a Saturday morning show that featured the Muppets and approached Jim about coming up with a concept. He and Jerry Juhl dusted off their Tinkerdee ideas and puppets from 1962, added a friendly dog character, and developed The Land of Tinkerdee. The series featured a human, Darryl, and his dog, Rufus, the first character created specifically for Frank Oz to develop. 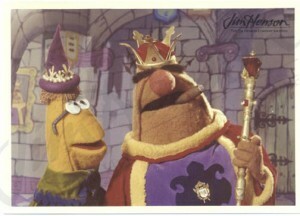 Darryl and Rufus were in the employ of King Goshposh as gatekeeper and watchdog. They generally introduced the story (much like Doc and his dog Sprocket in Fraggle Rock), and, as it progressed, the other residents of Tinkerdee got involved. Darryl was played by Darryl Ferreira who had worked with Jerry Juhl at the Oakland Recreation Department and was close to Frank Oz’s family. Mel Swope, Jerry’s college roommate, served as director. 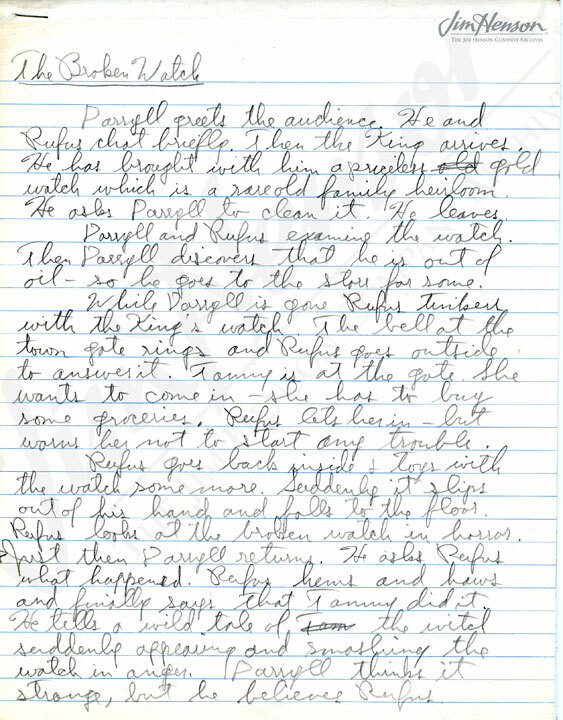 Jerry wrote numerous scripts, but only the pilot was produced. After Quaker Oats passed on the project, it never went any further. Clearly, Jim had developed a great affection for these characters – he used them later in an industrial sales film and on the television specials Hey Cinderella! and The Frog Prince. A clip from Jim Henson’s 1964 un-aired pilot for Land of Tinkerdee featuring Darryl Ferreira and Rufus (performed by Jim Henson and Frank Oz). 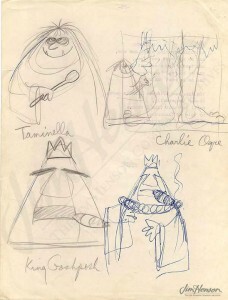 Jim’s character sketches for Tales of The Tinkerdee, 1962. 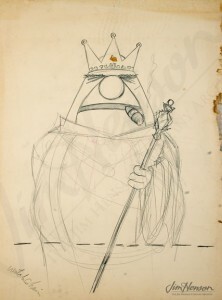 Jim’s scale design for building King Goshposh for Tales of The Tinkerdee, 1962. King Goshposh and his prime minister in Tales of The Tinkerdee, 1962. 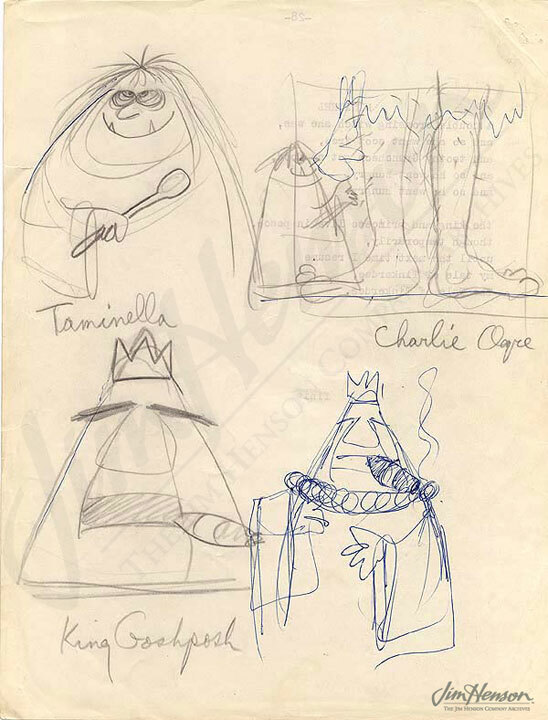 Jerry Juhl’s concept for the pilot episode of Land of Tinkerdee, 1964. 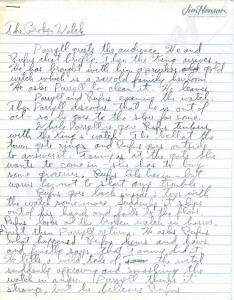 This entry was posted in 12-December '64, 1964, Frog Prince, Hey Cinderella, Tales of The Tinkerdee and tagged Atlanta, fairytales, Ferreira, Juhl, Muppets, Oz, pilot, Quaker Oats, Rowlf, Rufus, Swope. Bookmark the permalink.